The second board I tested is the NodeMCU development kit. 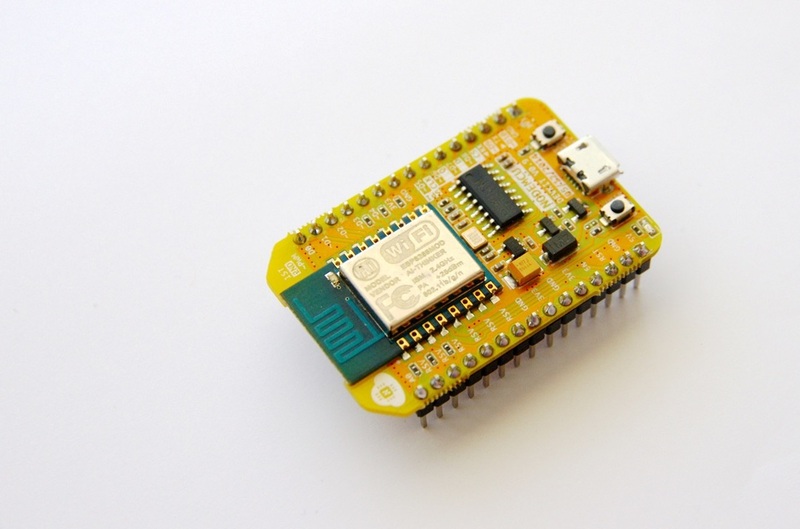 The NodeMCU board is based on an ESP8266-12 but features a built-in serial over USB interface and other amenities like 2 buttons and 2 LEDs. The board is compact and fits on a breadboard. The board is price at USD10~13. Although promoted for Lua, the board can be programmed using the Wiring / Arduino framework as the other ESP8266 boards. one analog GPIO, albeit limited to 1,8 V.
The NodeMCU uses the CH340 serial to USB programmer, which requires the installation of a specific driver. 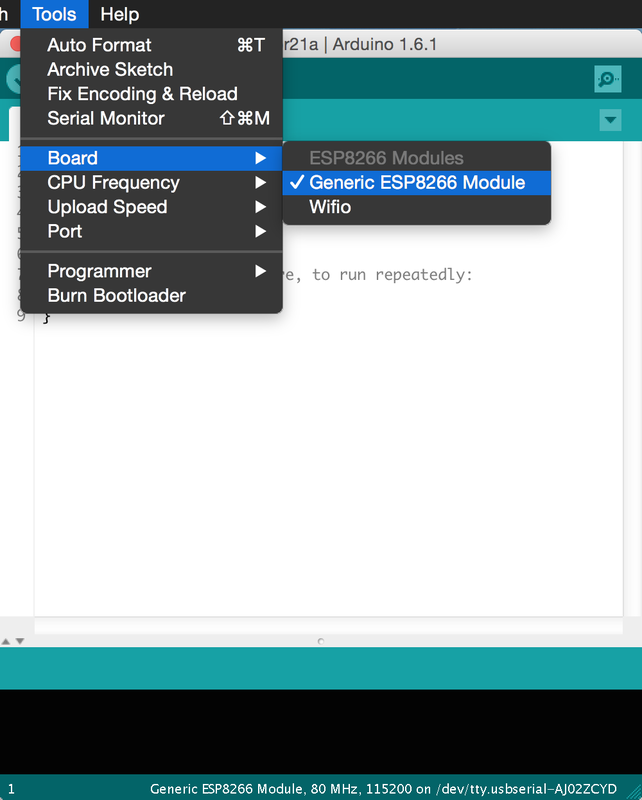 The IDE or integrated development environment is a specific release of Arduino-Compatible IDE with ESP8266 Support developed by Ivan Grokhotkov. The IDE is thus platform-agnostic and runs on Windows, Mac OS X and Linux. The only difference comes from the CH340 serial to USB programmer, which requires the installation of the specific CH340 USB to Serial Driver for Mac. On Mac OS, the default uploader provided with the IDE, esptool, supports the ESP8266-01 but doesn't work for the NodeMCU board. Instead, the pyesptool upload utility works fine. If the NodeMCU board is used with the Arduino IDE, the Lua firmware is erased and replaced by the sketch. The Lua firmware needs to flashed again in order to use the board with Lua again. Looking for more features, I designed embedXcode, a template I could use with Xcode. 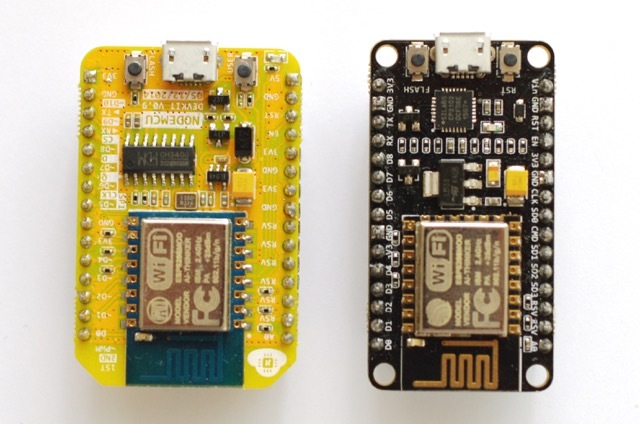 There's a new version of the NodeMCU board, called version 1.0. It brings a better USB serial programmer, based on the popular CP2102 from Silicon Labs. The board is also smaller, and fits easily onto a breadboard now. Once I've installed the utilities, I faced no issue with uploading to the board and using it. Connection to my WiFi network was fast and stable, and the web-server example ran on the first try. Again, the www.esp8266.com community deserves all the merit for providing documentation, libraries, examples and tutorials. This platform is supported by embedXcode, embedded computing on Xcode.